Fine art, Illustration, graphic design and the art philanthropy of Sam Morrison: Illustration Friday - "Contained"
Living on a lake has its benefits. It makes a great blank canvas. On this day the ice was probably 8" thick. 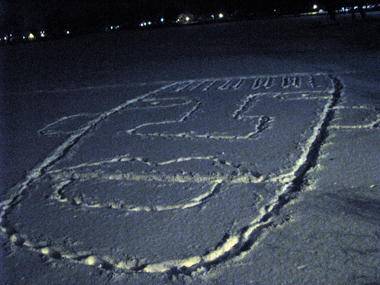 So I drew this while shuffling my feet through snow. In order to get from one part of the drawing to another I had to walk "contained" within my footsteps. now that's one medium I don't think anyone would have expected! Must have been great fun to do.